Instrike BlackPower Composite with only 420 gr. Schläger Intermed Stick 65 Flex Finally INSTRIKE introduces the follow up model of the bestseller GreenPower and it&apos;s been worth the wait!!! The stick is also a good Ice Hockey stick and Roller Hockey Stick for training court. 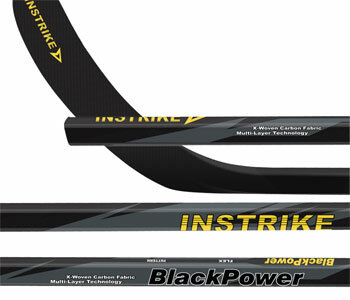 You can play for a long time with Instrike Hockey Sticks. Instrike didn&apos;t change the desing only. The german company pulled out a lot of new technologies from their magic bag. They introduce a lightweight stick that weights 440 grams only but by using X-Woven Carbon Fabric the stick has a better durability of 30% compared with the GreenPower. And the durability of this stick was incredible, already. The X-Woven Carbon Fabric combined with the Multi-Layer-Technology, several High Tech foil lines protect the stick from breakage by impacts of sticks, skates or shots. These absorbing foils are being from hosel to handle. By these two technolgies the stick delivers an amazing balance.